Details Dioptase is an emerald green silicate of copper mineral found in copper ore deposits along with malachite. We obtain our dioptase from copper mines in Altyn-tyube, Kazakhstan. Dioptase is a bluer green than malachite and varies in masstone color from strong bluish green to vivid yellow green. 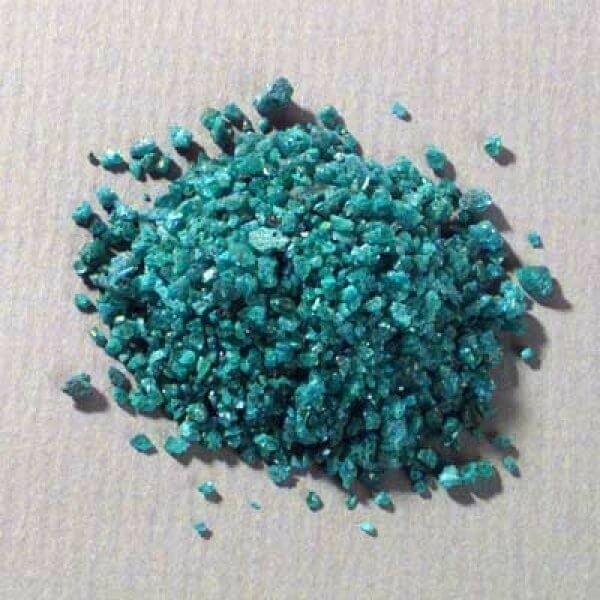 It is a beautiful emerald green, and is especially good in mixtures. Dioptase can add brilliant highlights to glauconite. 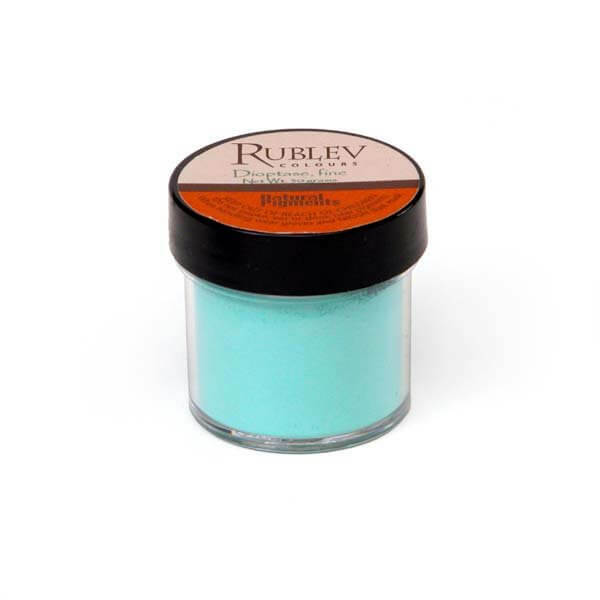 Use in its pure state where bright luscious colors are desired. According to Jaroslav Bauer and Vladimir Bouska in A Guide in Color to Precious and Semi-Precious Stones, the first known crystals of dioptase were brought to Semipalatinsk in Kazakhstan from the Kirgiz Steppes in Siberia in 1870 by the Bukharan merchant Akhir Mahmed. They were found on the western slopes of the Altai Mountains on calcite deposited in the numerous crevices of the limestone hill of Altyn-Tyube. Specimens sent to the Academy in St. Petersburg were identified by member German mineralogist R. Ferber as an emerald variety and named "achrite". Its low hardness made it less valuable than emerald, and it became known as "emerald for the poor". When it was determined in 1801 to be a new mineral, the French mineralogist Rene Just Hauy used the Greek words dia, meaning "through" and optasis for "vision" to create the name dioptase. This describes the visible reflections on the internal cleavage cracks. "Copper emerald" is a name also used by some collectors of mineral specimens, and this term appears in almost all collections. It is believed that dioptase has been found as a pigment on ancient lime plaster statutes found in a Neolithic site in Jordan. In modern history, as a pigment dioptase has not been in wide spread use more than 10 years. Dioptase is a copper silicate mineral found in many parts of the world, such as Namibia, Kazakhstan, Romania, USA, Chile, and Peru, in the upper oxidized portions of copper ore deposits along with malachite. We obtain our dioptase from copper mines in Altyn-tyube, 50 km east of Karaganda on the Kirghiz Steppe in Kazakhstan. The discovery of some fairly large worn crystals extracted from the gold-washings in the Yeniseisk area and the failure to discover other deposits led to the assumption for many years that Siberia was the only source of the mineral dioptase. Fine cuttable dioptase material now comes from Reneville in Zaire's Congo. The Otavi Range at Guchabo in Namibia produces small amounts of dioptase. Pinal County, Arizona in the USA, Copiapo in Chile, Baita in Romania, and Peru are other world sources for dioptase. 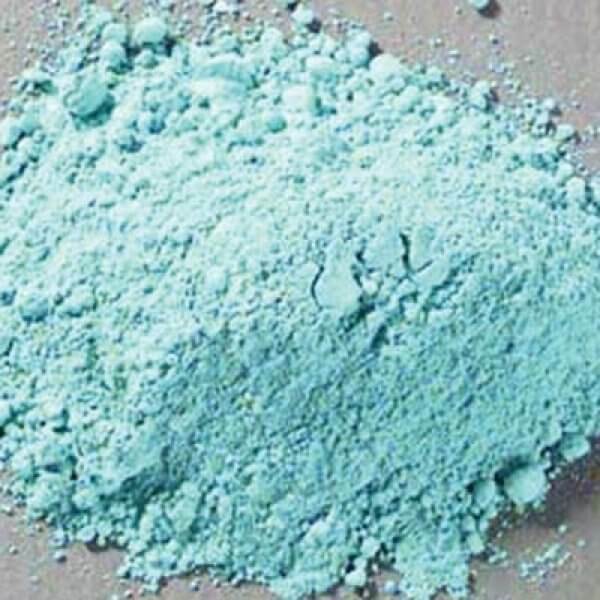 Available in two grades or fineness of grinds; fine and coarse, which produce corresponding light and dark tones of green when used in aqueous medium. This grade is fine and exhibits a light bluish green masstone. It is stable in mixtures with other pigments, and its color is best appreciated when applied with other greens such as glauconite. No data has been published on the permanence and compatibility of dioptase. No data has been published on the oil absorption properties of dioptase. Grinding produces a pigment that is paler in color than in coarser grades. 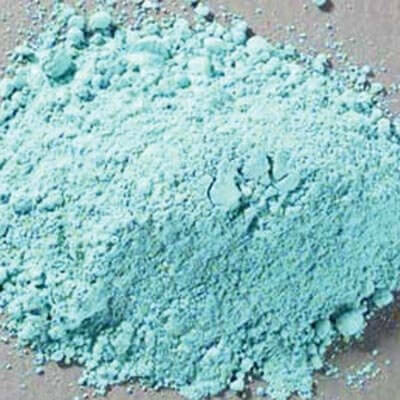 Dioptase is moderately toxic and care should be used in handling the dry powder pigment as well as the pigment dispersed in medium.